Salmo River Bull Trout are blue listed. Please release, if you catch them. 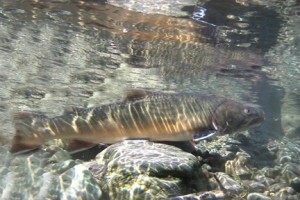 The Salmo River Bull Trout are a blue-listed species and closed to harvesting from the Salmo River. To draw anglers attention to, and try to mitigate the decline of the Bull Trout population; SWSS members have posted signs at popular fishing locations that include the local Fishing Regulations and an area map. Fish ID Cards that include illustrations to identify the different kinds of trout found in the Salmo River Watershed have been distributed to the public regularly through the local Salmo Valley Newsletter. The card includes an area map that outlines the fishing regulations for the different sections of the Salmo River and its tributaries. The card, placed in a clear plastic wallet, has been made available at Skyway Hardware in Salmo, BC. (purveyor of fishing supplies) and at various festivals and fairs. Since the inception of the SWSS in 1997, we have been involved in numerous fish population studies in the Salmo River. These studies have indicated that in the Salmo River system there are very low numbers of spawning adults of both Bull Trout and Rainbow Trout. A count taken in 2009 revealed that only about 60 spawning adult Bull Trout remain in the system, a decrease from approximately 200 spawning adults in 1999. Approximately 200 Rainbow Trout spawners were counted in the Salmo River in 2009. Given the low fish populations in this watershed consider what an impact just one expert angler could make on the fish population in one year if they chose to kill a fish every day of fishing season. Catch & Release provides a chance to enjoy a lifetime of fishing.